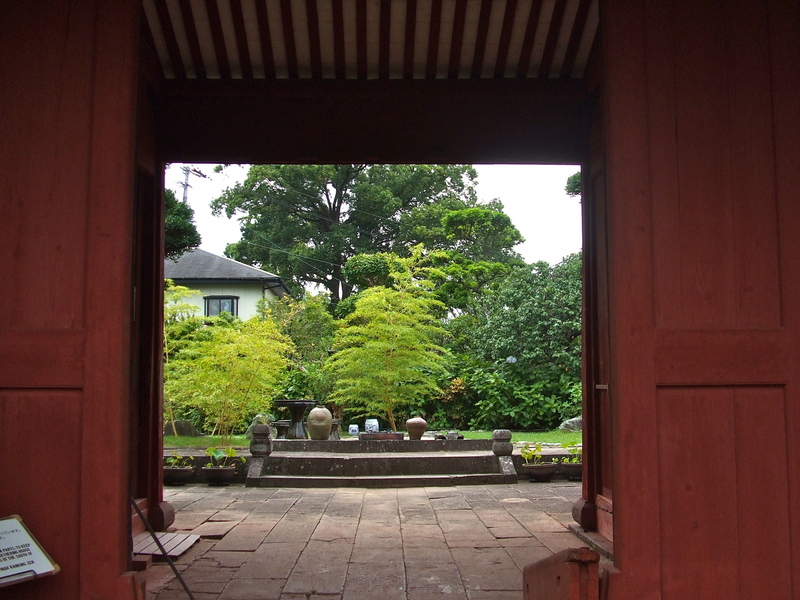 A passageway from a temple to garden in Nagasaki. Morning and evening are key transition times. A Japanese self-help book, a samurai self-help blogger , and a Japanese immersion website meet at a bar and talk about the best time to “do it.” Morning and night. Morning and night might be one of the best times to set your intentions, embedded knew knowledge, and change your life. I’ll just say that in terms of just outward behavior patterns, those two “anchor points” do tend to set pattern for the rest of the day. Broadly speaking, the rest of one’s day often seems to run off of the inertia from these two times of day. Khatz has been lightly hammering the idea of anchors in my daily “sprints” or suggestions for immersion. Basically, I take this to mean that the morning and the minutes right before sleep are the most key moments of the day. The morning sets the tone for the day and the minutes before sleep set the tone for the dream scape. I’ve been experiment with this in many ways. When I walk out in the mornings I often listen to japanesepod101.com podcast lessons. Yesterday, however, I felt the pull to listen to Japanese music. I follow whatever method or activity seems to be the most fun at the time. In the middle of a work day, I usually work through at emergency room like atmosphere at a school. As I get ready to sleep, I may read the supporting materials to the jpod lesson (if I’m interested) or listen to an non-jarring podcast. These days I “listen” to Tokyo FM’s Tokyo Midtown Presents, a pleasant and interesting program about different design concepts. The voices are so pleasant that I never consciously listen to the content before sleep. Does it work? Who knows? But I am enjoying Japanese, so why stop? Yukio Furuichi, author of １日３０分を続けなさい！人生勝利の勉強法５５　Learn to Win My (My take with a dash of soy translation: Keep going 30 minutes a day! 55 Study Steps to Winning in Life) also writes about the power of morning and the evenings. There are fewer interesting television shows in the morning. 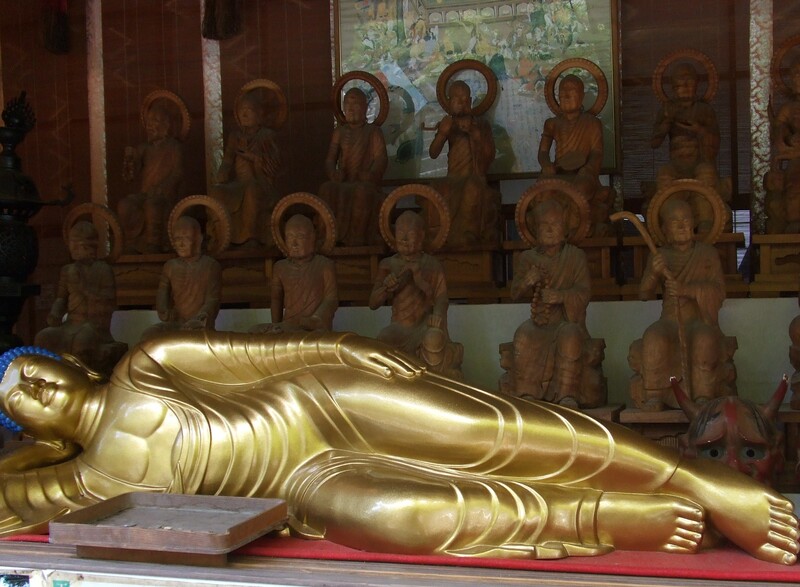 Buddha at rest. You have to sleep in order to wake up. If you can’t sleep, have something by your bed you can study. After you are tired (usually around 30 minutes) you should be able to sleep. Napping helps but don’t go for long naps because they throw off your biorhythms. If morning and evening are such powerful anchors, why limit using them to whatever you are studying? (Keep in mind that by studying I mean that you take on what you want to move forward in your life.) What are the thoughts and intentions that you go to bed with at night? I’ll be the first one to admit, that I often wake up with internal grumbling? But why not wake up thinking about what you want in your life? What you want for the world? Why not rise up singing? It’s the same with the evening. Instead of taking your worries to bed with you, what about going to bed with appreciations and your dreams for the yourself and the world? Sun up. Sun down. Samurai at rest. Samurai rising.